Today I’m taking a sick day. Mike is playing in a golf tournament and is gone all day and I have no plans. I haven’t had more than an hour or so by myself since September 3rd, the day I got pancreatitis #2. Combo of being in the hospital, so never having a second to yourself because a nurse, doctor or specialist is coming in to talk to you and now at home my mom comes every day and typically stays till when Mike gets home. (don’t worry mom, that doesn’t mean I don’t love having you, because I LOVE having you!) But sometimes it’s good to have some time with just yourself. It’s hard not to feel like everyday is a sick day for me lately. I’m home, my mom’s taking care of me, I don’t feel good, I’m taking a bunch of medicine. Sounds pretty similar to a sick day from growing up. There’s always something a little enjoyable about staying home from work or school even when you’re not feeling well. You feel lousy but you love getting to stay in jammies all day and watch the Price Is Right. But when your sick day is going on 9 months, it loses its enjoyability. Today, however, I’m choosing to stay in my pajamas and watch trashy TV with just ME all day. Cancer or chemo didn’t make me stay in, I decided to stay in and that’s why it feels different, that’s why it feels fun! So before I exert too much energy, I’m heading back to lounging! p.s. 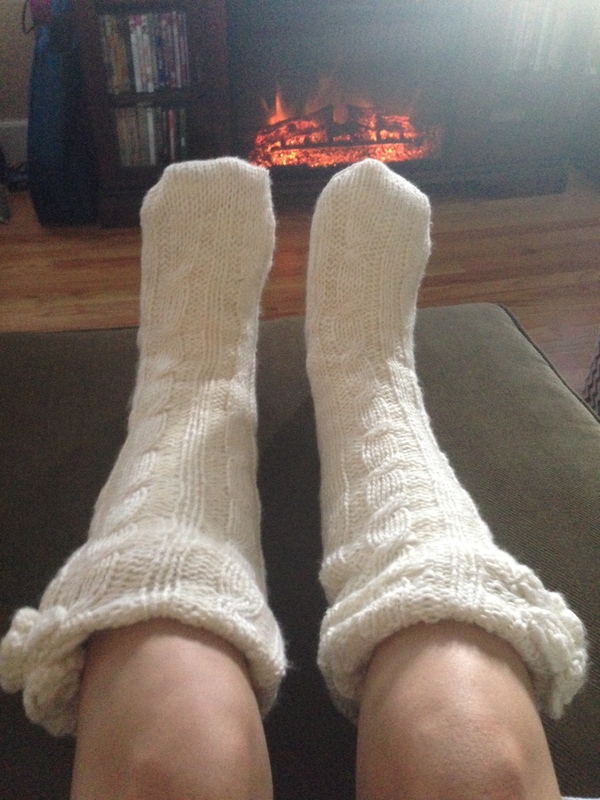 look at these ridiculously amazing slipper socks I got at TJMaxx! I shall be in them all day. Good for you enjoy your day hugs!